We are coming into winter squash season and I cannot help but get excited! Today we are sticking to a limited ingredient list that will get you in and out of the grocery store quickly so you can savor some time spent at home as the oven warms the house and some good food and good friends go to work at warming the soul. - To serve, ladle soup into warmed bowls, top each serving with a Tbsp of Browned Butter (recipe below), a sprinkling of Candied Ginger (store-bought or home-made - recipe below) and a dollop of Savory Whipped Cream (recipe also below). A nice hunk of crusty bread and some parmesean wouldn’t hurt either! For each portion of soup you serve you will use about 1 Tbsp of butter but you can make as much of this butter as you want and even reserve it to add flavor to dishes later! - When the butter is browned, remove from heat and add in a touch of acid (white wine, citrus juice, or vinegar) The acid will halt the browning process so the butter does not burn! This recipe is very simple but it requires the use of a Silpat, which is a plastic-like pad that is used to line cookie sheets when doing certain types of pastry work. It is ideal for this type of recipe because the candied ginger and its cooking liquid need to cook before eating and if left to cool on parchment it will become a sticky mess, or if left to cook on a sheet pan and you will end up prying ginger pieces off with a spatula. If you do not have a Silpat this is an excellent addition to any kitchen! 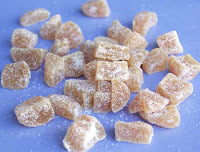 - Disolve sugar in water and add ginger. Boil ginger in sugar water for at least 45 minutes. If water reduces too much, add a little more. - When ginger is tender in texture and has lost its aggressive spice, strain out and let cool on silpat for half an hour. 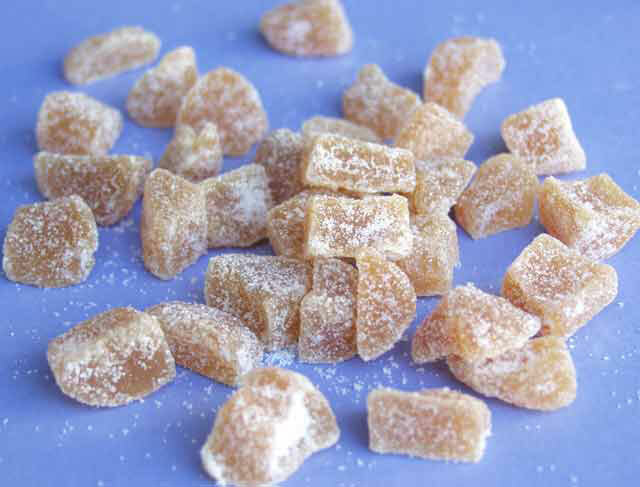 - When ginger is room temperature, toss in granulated sugar and leave out to dry at room temperature overnight. - Whip cream vigorously in a chilled bowl until soft peaks form. 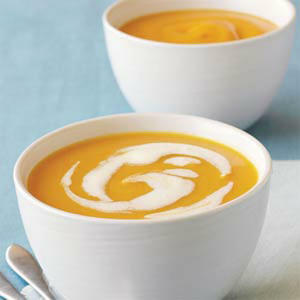 - Season with salt and pepper and zest from lemon and dollop on soup right before serving. - Since there is no cream in the soup this last minute addition lets you accommodate for dairy allergies/intolerances and gives a beautiful visual affect as well! Okay, I am totally making this. I know, right? I would happily plan my life around the making and consuming of this soup. Go, Cara!